^ Piepenburg, Erik (30 April 2009). "Anthony Page of Waiting for Godot Teaches Us How to Pronounce Its Title". 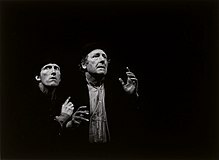 ^ "Wachten op Godot – Stichting Toneelschuur Producties – 1988-04-12". theaterencyclopedie.nl (in Dutch). Retrieved 29 March 2018. ^ McCrum, Robert (15 August 2016). 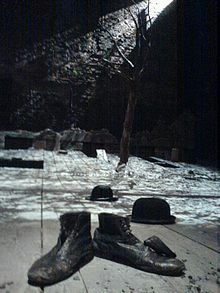 "The 100 best nonfiction books: No 29 – Waiting for Godot by Samuel Beckett (1952/53)". The Guardian. Retrieved 18 January 2019. ^ Schlueter, June (1988). Brunkhorst, M.; Rohmann, G.; Schoell, K. (eds.). 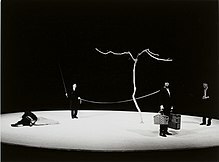 "The American Theatre since Waiting for Godot" (PDF). Brunkhorst. Heidelberg: Universitätsverlag Winter: 218. Retrieved 2 December 2018.